Spent apx. 1 hour on beach, did not find any glass. Notes: The stairs here are steep and is a little work out coming back up! Fort Funston beach is the shoreline of the Fort Funston protected area within Golden Gate National Recreation Area. The park lies at the southwestern extremity of San Francisco. Fort Funston is characterized by high dunes closely backing the beach area. 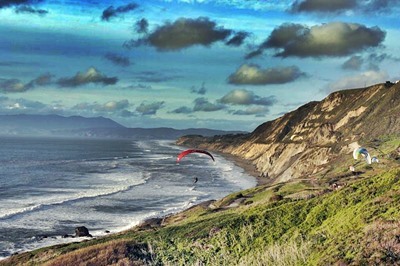 Facing the open ocean and catching the winds off the Pacific, Fort Funston is a favorite for hang-gliding. 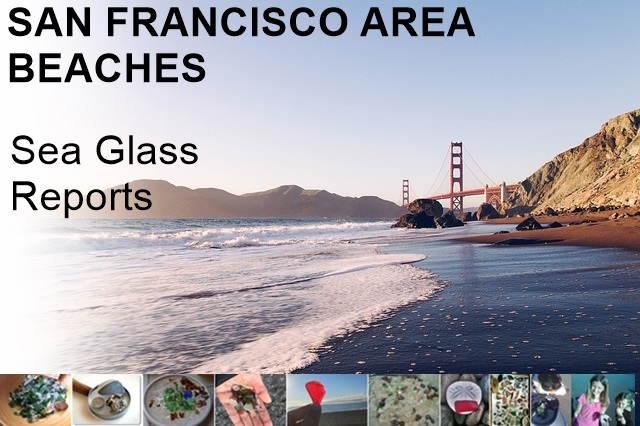 Although sandy beaches don't generally prove to be that good for finding sea glass, there are exceptions (see Seaside Beach) and Lin and I would love to hear further reports on the Fort Funston area. The land was acquired by the federal government in 1900 upon the establishment of the Lake Merced Military Reservation, with the purpose of assisting in the coastal land defense for San Francisco Bay. The fort, renamed for Major General Frederick Funston in 1917, began to take shape during World War I, with the construction of a parade ground, barracks and a series of coastal batteries. The batteries were declared obsolete shortly after World War II, but Fort Funston later became a Nike missile launch site. The fort was inactivated in 1963 and eventually transferred to the National Park Service to be administered as part of the Golden Gate National Recreation Area.